"Some people say that mountain climbers are really wasting their time. They have nothing better to do so they climb mountains, tire themselves out, and come back with nothing to show for it. Yet a person who climbs a tall mountain sees the world in a very different way from someone who never leaves his own front door. Genuine mountain climbers do not struggle up great precipices for the glory of it. They know that glory is only a label given by others. A true climber climbs for the experience of climbing. And this is an experience no one can have without setting a foot on the mountain path. If there is any purpose in Chan, we may say it is to discover the nature of the self. Those who make this effort discover something sublime. They do not strive for glory and praise from others. Rather, they do the work for themselves." - Master Sheng Yen, excerpt from the book "Dharma Drum : The Life and Heart of Chan Practice"
This was a passage I found rather inspiring when reading the book. Putting aside the practice of Chan, I gather this can be applied to every other facet of life, where the focus is to be placed on the experiencing the process itself, instead of the end goals. The process in itself, is the end goal, and the result, is the mere icing on the cake. Obviously the "mountain" in itself needs to be a worthy one to undertake, and the intent on why to climb needs to be examine and congruent with oneself, but that is another topic to explore another time. Alright, short round up this time. Total for March 2019 was S$2,569.51, and this was a bit of an aberration, as I spent the first 13 days in North Asia, and cashed out most of my vacation expenses in the prior month. The largest category was attributed my upcoming North American adventure in June. Started to book out essentials such as accommodation and transport in March, and this involves paying some part of it upfront via credit card, and the remainder over the next few months, so I reckon this will be the largest contributor to expenses in time to come. The second largest category was of course, eating out. Not much to say about this actually, but this seems to be in line with what I would have spent if I were in Singapore the entire time. The third largest category was gift. I had two birthdays in the family to celebrate over this month, and we spent some cash at some restaurants to have a good time. It is times like these I'll remember going forward, when each of my siblings branch out to form their new families. Already, with one of my siblings moving out on a partial basis, I'm starting to feel that the process of developing our own lives will intensify over the next few years, so it's probably better to cherish these rare occasions when there's still that closeness available. Things after all, are impermanent and will always change. In any case, am about 36% below my budgeted allowance. So all's good. But I'm certain the next couple of months might see some heavy outflows as I embark on my journey to North America. Hyflux investors up in arms - any justification for this? A lot has been said about the Hyflux saga thus far, and if its investors have their say, they would be talking till the cows come home, even if the barn is now empty and the cows have bolted into the sunset. In fact, there is even going to be a planned protest by retail investors tomorrow at Hong Lim Park, whereby the objective is to appeal to the Public Utilities Board ("PUB") to reconsider its intention to takeover the Tuaspring Desalination Plant ("Tuaspring") at donut. Well I suppose even Tuaspring can't desalinate any bit of saltiness these investors have. After all, this is an even worse proposition than having potential investor SM Investments ("SMI") come into the picture, where the retail perp and pref shareholders will get a max of 10 cents on the dollar for recovery. My personal view is that the latest move by PUB is borne out of protecting the country's interest, and it's a great logical move to make. If SMI pushes through their restructuring proposal, it will most likely put forth a restructuring of the economics of Tuaspring with PUB, and having a foreign entity trying to restructure a country's strategic asset with the government would result in a huge landmine of potential undercurrents to traverse through. It makes absolutely no sense for PUB not to do this, and it seems like they are actually showing some goodwill at taking over Tuaspring at donut, given it seems like they could have contractually asked for Hyflux to pony up the negative net present value of Tuaspring at its current valuation. As for the timing of PUB's announcement, it's fantastic. Wait till the cards fall, and at the last minute once all information has been gleaned, make your play. Classic, and I can only say bravo. And if I'm in SMI's position, I would surely walk. A large part of their investment proposal seems to stem on value release on Tuaspring, and with that asset gone, it wouldn't make any sense for me to stay on. For the other assets in the Middle East, I wouldn't quite ascribe them much value if any from a downside credit perspective. Look at the E&Y report for estimated recoveries vs liabilities. What investors need to know is no one owes them anything. Asking for a backstop for your investment from the government is akin to going to a casino and asking the casino to provide you a guaranteed return on your chips, or a waiver of losses. One simply does not do that, and no government in its right mind would do something like that, unless of course, it's too big to fail and poses emblematic systemic failure, such as the financial crisis of 2008, where there was a massive bailout of banks and their investors. Even in that situation, one should not expect or ask for something like this to happen. So how does one prevent a similar situation from happening again? Well, there is no way this can be prevented in a capitalistic society. There will always be business failure, and there will always be a sucker. In this case, the investors (senior banks, retail investors) are unfortunately the suckers. Thus the question is really how can a retail investor prevent oneself from being the sucker. Here are some tips for the perpetual securities and preferred equity retail investors. Know what you are investing in and the key business drivers to keep track of to determine viability of holding onto the investment. Look at where you are in the capital structure and the protections afforded to your capital investment. Hindsight is always 20-20, but to put things in context, in this situation you are quasi equity with no security, loose covenants, and a max 6% unlevered yield. Most likely if Hyflux ends up in insolvency, you'll get donut back, and this should be the operating thesis you'll should be happy to live with. Also, given the bet of Tuaspring and the revenue contribution of water vs electricity there, if wholesale electricity prices fall on a sustained basis, it'll put the entire project, and the going concern of the Hyflux in jeopardy. Once the price of wholesale electricity falls for a sustained period, one needs to start looking at the viability of the investment. For the risk-return basis of these perpetual and preferred securities (the "instruments"), I wouldn't have touched them with a ten foot pole. If you didn't quite understand what I had surmised in the above paragraphs, I would kindly suggest to either get educated (there are a lot of accounting 101 courses out there), or to avoid such investments all together. So lets say you are a yield hog and you like the yield of the instruments, and don't quite understand what Hyflux is doing, and you want to make an investment. In this situation, my suggestion is to de-risk yourself by having a hugely diversified portfolio. Have no more than 2-3% of your portfolio invested in any investment, and it wouldn't be so painful or necessary to organise nor participate in a useless protest as a method for catharsis. I was a banker in my past life, and specialised in structuring credit loans. Part of my remit involves dealing with private banking clients where we would de-risk ourselves by syndicating some of these credit instruments to ultra high net worth individuals. In these situations, it would always be caveat emptor, buy at your own risk, and there would be big boy letters involved. From my experience, it isn't that the banker is trying to screw the retail investor, but its that the banker is merely looking out for his own self interest, namely the commission. I can't paint every banker with the same brush, but for one, I wouldn't wake up every morning trying to think of screwing the retail guys, I would just be looking at how to maximise my return on time, namely bonus and commission. Regardless of the existing regulations at that time, if a banker is trying to sell you an above market yield instrument (6% would surely constitute that) and give you leverage so you can amplify your yield, you should be extremely wary of taking a position on that, more so, even considering taking leverage on that. You need to do your own homework (see tip #1 above) and come to a conclusion, especially if you are going to sink a majority of your gun powder into it. That said, see tip #1 above again - please diversify and don't take unnecessary concentrated positions to prevent crazy heartache. As I always preach, in these situations, you can trust, but verify. And please, don't ascribe blame nor reliance on the auditors in this situation. They were merely doing their gig according to the accounting principles and regulations, and given the drastic changes to the business drivers and hugely levered capital structure, it was pretty obvious that this was a blowout waiting to happen. Don't hate the game nor the players. It's one's choice to participate in it, and there are always things one can learn to minimize losses and maximize gains in the future. First full month in Singapore since I left the workforce last August. Despite that, or probably because of that, spending this month fell within my budget of S$4,000. And this was CNY month, which typically sees the maximum monthly outflow in the year, because of traditional red packets that are given to my parents. 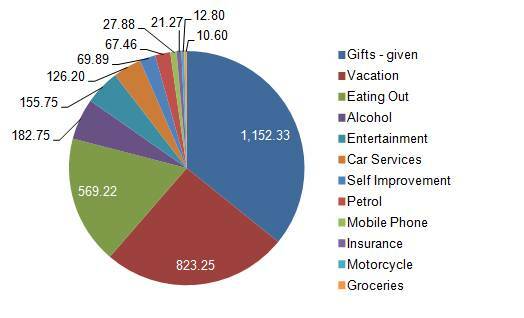 Top category was "Gifts - given", which took up c.35% of total monthly expenses. This was attributed largely to CNY as explained above. In addition, my partner's birthday is in February, and we went out to have a nice memorable dinner, plus a useful birthday gift that would hopefully aid her in her practice going forward. Second largest category was "Vacations", as I cashed out some miles and exchanged some SGD for envisaged spending during my overseas trip come the first half of March 2019. And third was "Eating Out", as I spent more time outside breaking bread and downing drinks with friends and family during the festive CNY season. Also, this was the first whole month that I was in Singapore, albeit this being a short month, so this category seems just about right. Total spending came up to S$3,219.40, which is c.19.5% below my monthly budget. Thinking back, this is pretty much the sweet spot, and adjusting for one time expenses such as CNY red packets to parents, it could have been lesser. However, the important thing is that at no time did I feel that I had gone overboard, or that I should be spending less. It does feel extremely gratifying to be able to have the capacity to deploy resources in exchange for happiness, and this is something I'll always be thankful for. Happy New Year 2019! Massive expenses month to kick off the new year. 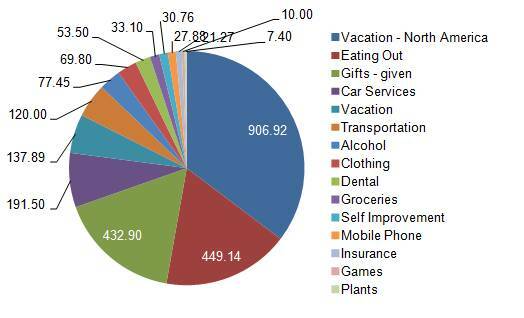 Largest expenditure category was Vacations. Spent a little more than a week in Thailand with my entire family this month, and went a bit over the top with the requisite complementary expenses such as alcohol over there and the duty free shop. Speaking of which, the duty free shop at the Airport isn't exactly that cheap... I can find better duty paid prices in local stores, which is surprising actually. 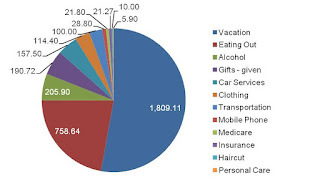 Anyhow, a large majority of the expenses of this category was contributed by a return air ticket to the USA. Will be heading there for a month and a half in the middle part of the year, and I managed to snag a decent airfare with a sweet top tier Asian airline at c. S$1,150. That was a good steal. Second largest category was "Eating Out". Had some good meals out at certain restaurants this month, but this category wasn't as much as expected, as on other days I began to experiment with cooking in (scrambled eggs with sausages anyone?). Third largest category was Alcohol. Much of it was duty free expenses at the airport, and I had a bottle of wine with my partner at a local wine bar this month. No regrets here, though on a separate note, I could probably cut back a bit on the imbibing. So I'm about 14% under budget this year with what is my largest monthly expenditure thus far. All is good, and I'm happy with the balance in my life. In fact, I think I could be spending more, but I don't think that would necessarily increase my level of happiness. I do think February is going to be a big expense month , given Chinese New Year and several other notable events worth celebrating, and I would be happy to bust the budget if necessary, given the lower than expected incurred expenses since I left the workforce. Expenses came up to S$2,863.78 in Dec 2018. Boy oh boy, it was a "decadent" month from an experiential standpoint. Flew out to Thailand and Indonesia thrice this month, and was away for 19 days. Majority of the expenses for Vacation / Diving were already front-loaded in November, given this is a cash accounting concept of expenses, so let's see what contributed to the bottom line in Dec 2018. Largest category was Diving. This involved front loading diving expenses for a diving trip in Jan 2019 to Khao Lak, where I wanted to check out Richelieu Rock, Koh Bon and Similan Islands. Also, paid up for an add-on course module that allowed me to take on Nitrox Air in the future. Second largest category was undoubtedly Vacation. This involved spending on accommodation and airfare to Indonesia to cross the New Year with my partner, and also for payment of accommodation for the second part of the Jan 2019 diving trip with my family in Phuket. 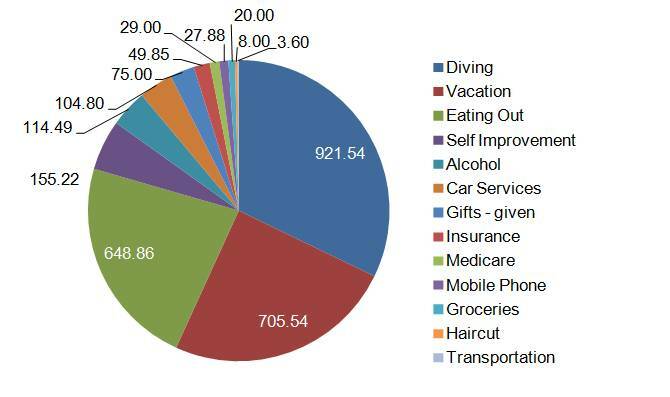 Eating Out was the third largest category. There were many catch ups with various groups of friends over the holiday season, and as a family, we indulged in the festivities as well. Fun times. So I was about 28% under budget this month, and I believe I really did live it up this month, and am happy. Not that I'm challenging myself to use up my budget, but perhaps there is a case that I really am quite content with what I have at the moment, that there probably isn't any further utility from increased spending. 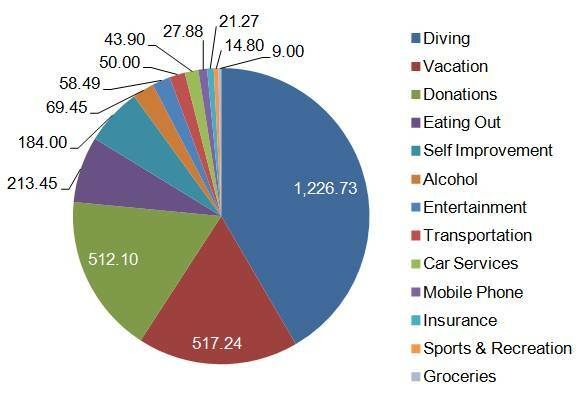 Expenses in Nov 2018 totaled S$2,948.31. Diving took up c. 42% of it. Decided to embark on my Advanced Open Water Diving certification, and headed to Indonesia to complete the requisite dives. That was a pretty good few days, and it was fun to be underwater after more than 12 years again. Vacation was the next big category. This involved hotel expenditure and envisaged expenses as I went over to Chiang Mai for a meditation retreat and a short holiday thereafter. Retreat was great, and Chiang Mai is certainly a really livable city. It does seem like a place that I'll be happy to stay for sometime. Donations rounded up the top three categories. Spent about 3.5 weeks in Malaysia on meditation retreat over the course of Oct and Nov 2018, and donated some cash to fund living expenses. Most of, if not all of the meditation retreats are donations only, so thought it apt to at least cover my perceived living expenses. I'm 26% under budgeted for expenses this month, and while the safety margin could have been more, am glad that I went ahead to get my diving done. That's not a cheap sport, but it's certainly a worthwhile one. Some of the scenes underwater are amazing, and it feels good to be able to have the chance to experience it in this life.